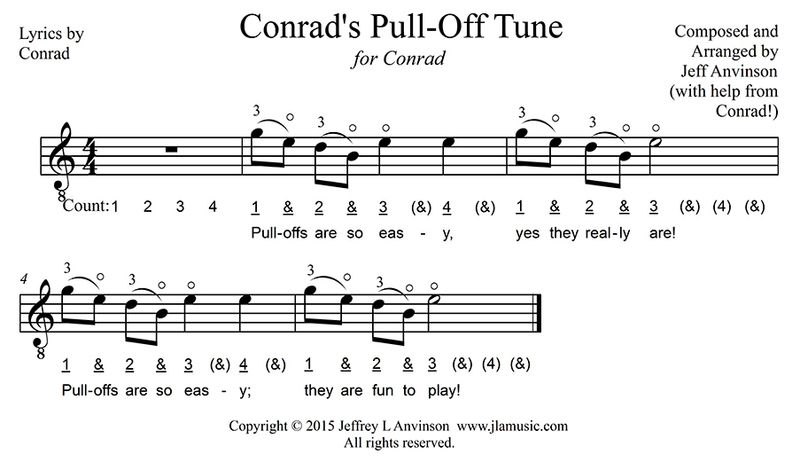 JLA Music - Learning Guitar Notes - B, D, E, and G: "Conrad"s Pull-Off Tune"
This web article discusses two things: Playing the notes B, D, E, and G in first position on the first two strings of the guitar, and how to perform pull-offs. A pull-off is a special way to make notes sound without plucking. Pull-offs are denoted by a special sign called a slur. The first note of the two slurred notes is plucked normally. The second note is plucked with the fretting hand by pulling down and slightly away from the string towards the floor with the fretting finger. The fretting finger alone does the plucking of the second note. Your hand should not move. 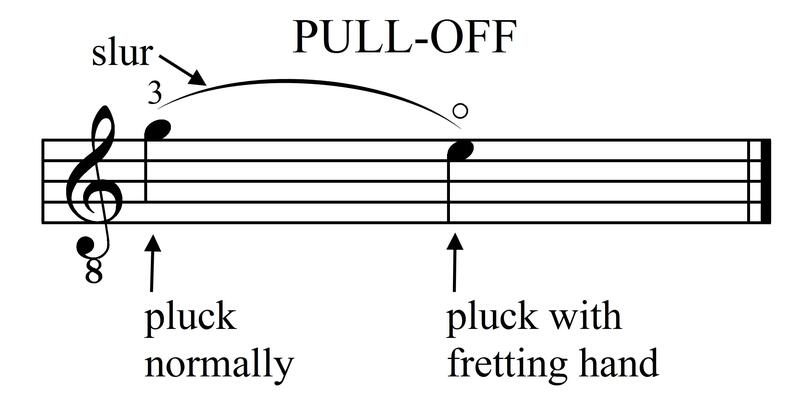 Pull-offs always descend by going from a higher-pitched note to a lower one. Although there are several ways to perform pull-offs (down and away from the guitar, down and into a lower string, etc) they are usually produced by pulling down and away so as to avoid plucking other strings. Sometimes there is more than one note that is "pulled-off", in which case the slur extends over more than two notes. You can see videos of several pull-offs by clicking here and here. The pull-off technique that you see in these videos is one that is often used on nylon guitars, where the fretting hand fingertip comes to rest on the lower string after performing the pull-off. (If there is no lower string, such as when pulling off of the first string, the fingertip simply stops just below the edge of the neck of the guitar.) You may use this technique, or you may pull the fingertip out and away from a string as well. This latter method of pulling off is more often used on steel string guitars. There are several other ways to perform pull-offs - including pulling off in an upward direction, pulling straight out, and - rarely used - pulling off in an upward direction and coming to rest on the string above. The latter three techniques are more advanced and less-often used. The pull-off technique recommended for the piece below is downward and out away from the guitar. This technique will work well on the second string because it will allow you to avoid plucking the first string with your fretting hand finger by mistake. 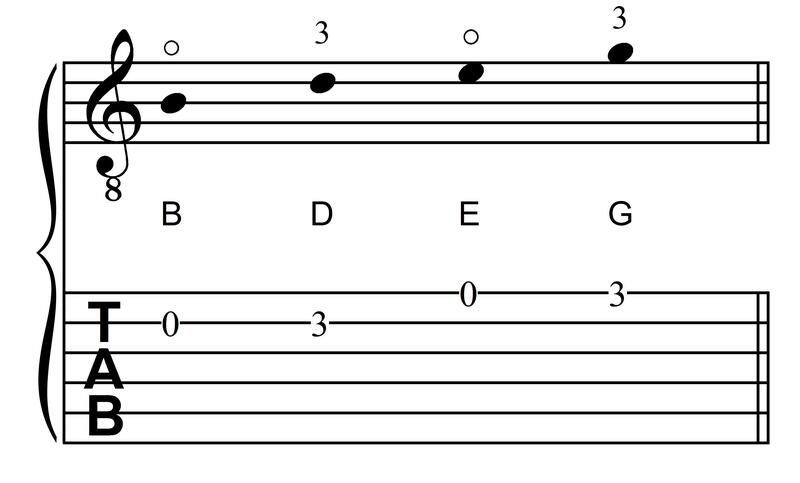 The piece below will give you some practice learning the notes B, D, E, and G in first position on the first two strings of the guitar, plus it uses the pull-off technique several times. There is an accompaniment track audio clip below the music. If you are listening in stereo, you may adjust the balance all the way to the left to hear only the accompaniment, or all the way to the right to hear just the guitar. Set the balance in the middle to hear both. I composed, arranged, and recorded this piece for one of my young students, Conrad, who wrote the lyrics and provided the bass line for measure two through five. Bravo Conrad! I hope you have fun playing this tune!